I write a lot about building projects, parks, and actions taken by Redwood City’s City Council and Planning Commission. Rarely do I focus on the less glamorous, but nonetheless extremely important, work done by our Public Works Department and its various subcontractors. But over the last couple of weeks I’ve noticed a number of infrastructure projects underway, enough so that I decided they deserve their own post. 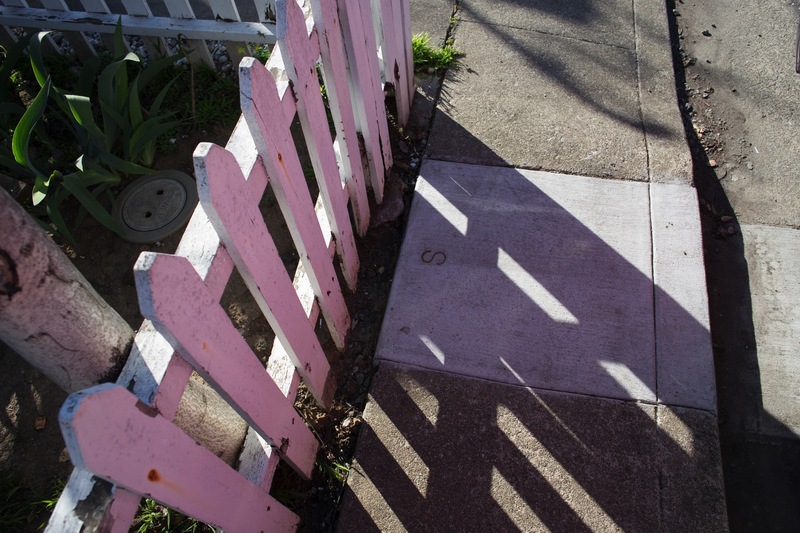 One of my good friends likes to say, “Own a house, own a project.” As one who is fortunate enough to own a house here in Redwood City, I’m well aware of how much work it takes to maintain it. On my walks I see plenty of houses and commercial buildings where the owner is either unable or unwilling to perform the needed up-keep. While at first the deterioration is mostly cosmetic, given time the really serious—and expensive—problems set in. Preventative maintenance is key to avoiding those serious problems. 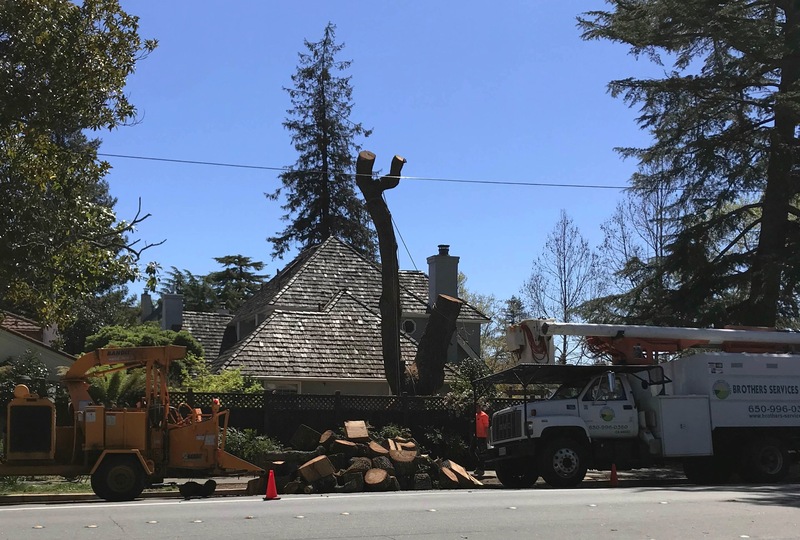 As I write this I can hear the sounds of a tree grinder: apparently a huge oak tree in a nearby yard was dying, and the homeowners wisely decided to take it out. If they had ignored the problem, one day that tree could have fallen onto their house, causing untold damage. Somehow I find it easier to pay for a room addition, say, or a landscaping project—something you can see and enjoy on a regular basis—as opposed to a project that takes place entirely under the house or inside the walls. Although it may be necessary to have the house rewired or re-plumbed, for instance, doing so just isn’t as exciting. These kinds of “infrastructure” projects, though, must be done to keep the house functioning well. City projects are much the same. It’s easy to get people excited about building a new park, but tell them you are going to spend millions of dollars replacing many of the city’s sewer lines, and you’ll hear a lot of grumbling and get a lot of questions. But the mostly invisible work that our Public Works Department does is extremely important, and is needed to keep this city running smoothly. The next time you are slightly inconvenienced by guys like those in the above picture, know that they are keeping the sanitary sewers clear and preventing the sewer lines from backing up into your house or apartment. I can remember years ago when the sewer lines along Hopkins Avenue occasionally backed up, causing sewage to bubble up around some of the manhole covers. Thanks to our Public Works folks, though, I haven’t noticed that problem for many years now. Replacing old sewer and water lines is something that the city has been doing for a long time. Periodically they select a new part of the city and focus their efforts there. 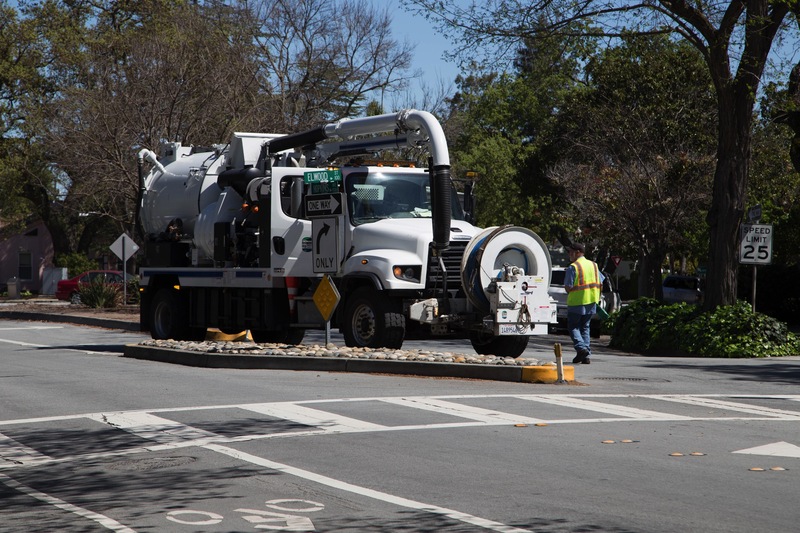 Lately they’ve been working on a number of streets on either side of Woodside Road, mostly in the vicinity of Hudson, Gordon, and Kentfield. When the contractors are working they are hard to miss, what with all of the cones, detour signs, and heavy equipment. But even after they have moved on, at least for a while, it’s easy to tell that they’ve been there: telltale paving stripes indicate where the sewer and water lines were dug up and replaced. Note that not only does the stripe run down the middle of the street, there are also branches running perpendicular to the street. That is because the city not only replaces the mains, they also replace the branches running from the main to each house. Not all the way to each house, I should note; usually to a point in or near the sidewalk, where there is a clean-out or water meter. Note how the contractors mark the sidewalk with an “S” to indicate that the sewer line runs beneath. The presence of the clean-out nearby (here, just to the left of the fence) should be a clue, but since that clean-out is on private property and thus could get buried or hidden under a bush, the “S” serves as a helpful signpost should future problems arise. 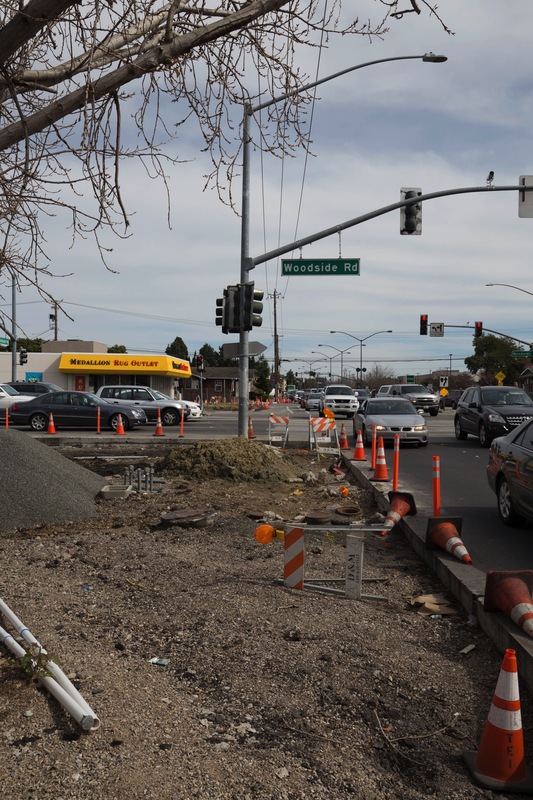 This Middlefield Road and Woodside Road Intersection Improvements project aims to enable safe and legal pedestrian access to this intersection. Unless you’ve walked here you may not have noticed that today there are no crosswalks at this intersection. As a pedestrian, if I want to cross either Woodside Road or Middlefield Road in the vicinity of this intersection, I have to take a multi-block detour. This is a major inconvenience that, I suspect, causes many pedestrians to simply cross Woodside Road illegally—which, given the width of the street and the volume of traffic it typically carries, is really dangerous. The project involves rebuilding the intersection to add new sidewalks, curb ramps, and four new crosswalks. The intersection will also gain pedestrian signals and roadway lighting, and the signals will be upgraded. Oh, and for those of you who are cyclists, this project will also add some bicycle lanes. 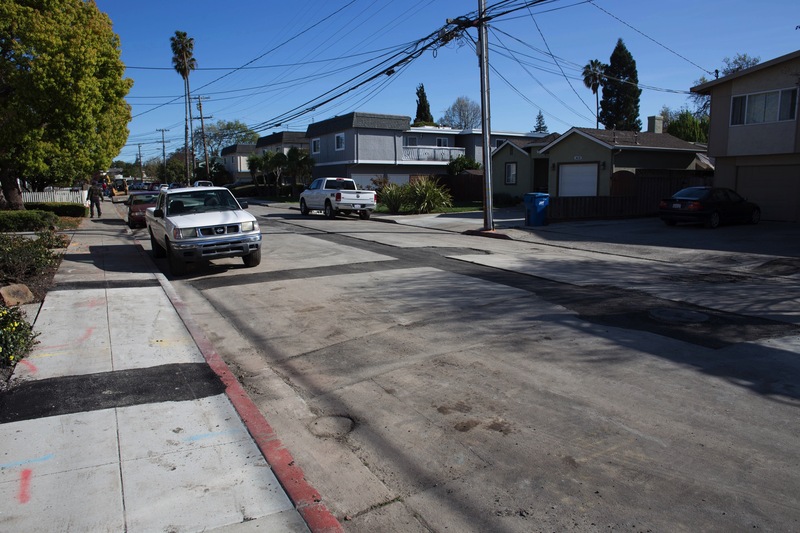 This is just one part of the Caltrain Grade Crossing Improvements project, which is taking place at three points where the Caltrain tracks cross major Redwood City streets: at Whipple Avenue, at Broadway, and at Main Street. At all three intersections the aim is to improve the crossing. What is being done, though, differs from one intersection to another. As I understand it, those two lanes marked with the white arrows will become three: dedicated left- and right-turn lanes and, between them, a straight-ahead lane. It appears that this will all be done with paint, plus a new sign or two. Not so visible is the upgrade that some of the equipment controlling the intersection will be getting. Directly across this intersection Broadway will be re-striped as it approaches, replacing the dedicated bike lane and single traffic lane there today with two shared (by cars and bikes) lanes: one for turning left, and one for proceeding straight ahead or turning right. Because the traffic volume on Stafford is fairly low, and because of that center island, I don’t find this intersection too difficult to navigate. However, if I was in a wheelchair, or was otherwise impaired, it could be extremely difficult. Look closely at the above picture, though (click it for a larger image), and you’ll see painted temporary markings and saw cuts in the pavement. The markings indicate to where the sidewalk will soon be extended: both the near corner (where I’m standing; at the bottom edge of the photo) and the far corner will gain “bulb outs” with curb ramps, shortening the distance that a pedestrian will have to travel and enabling a wheelchair to transition between sidewalk and street. Then, to give vehicles sufficient room, the small triangular island you see in the photo will be removed. 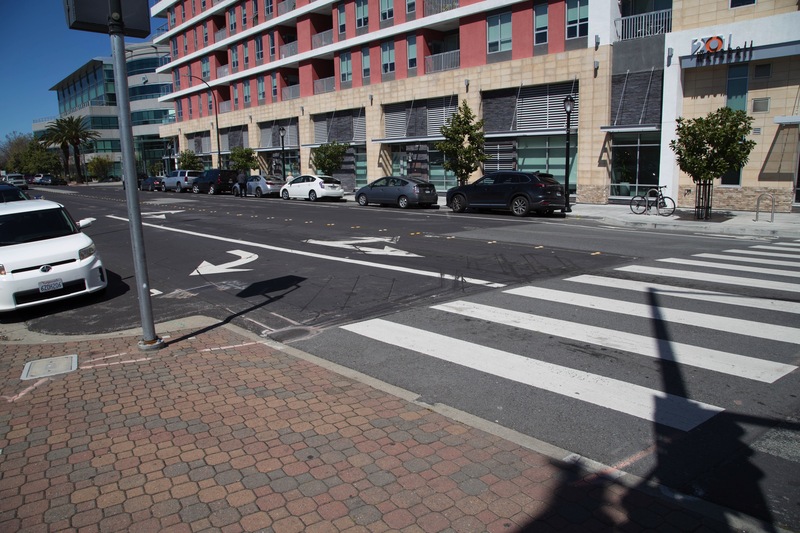 Finally, a clearly marked crosswalk will be painted across Stafford Street. The third intersection, where Main crosses the Caltrain tracks, is probably the least traveled of the three, but as someone who regularly walks through there I can attest to the need for an update. This intersection has three elements: Main, the Caltrain tracks, and Pennsylvania Avenue, which closely parallels the tracks on the east side. Complicating the matter is the fact that there is no marked crosswalk, making the crossing somewhat unnerving. Fortunately the city is adding a prominently marked crosswalk, a bulb-out (with curb ramp) where the sidewalk hits Pennsylvania, and new curb ramps on the two corners where nearby Elm runs into Main. New signs and new streetlights complete the project, at least for the city. It does appear that at some point Caltrain will improve the interface between the tracks and the street. 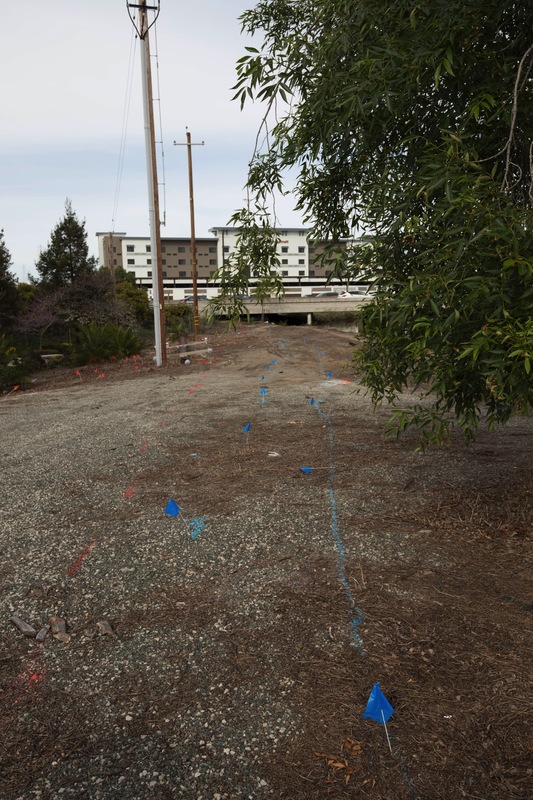 I, along with a number of people who live beyond Highway 101, am greatly looking forward to the completion of this project: I spend a lot of time walking on the other side of the freeway, and it will make my trip back and forth significantly easier and safer. 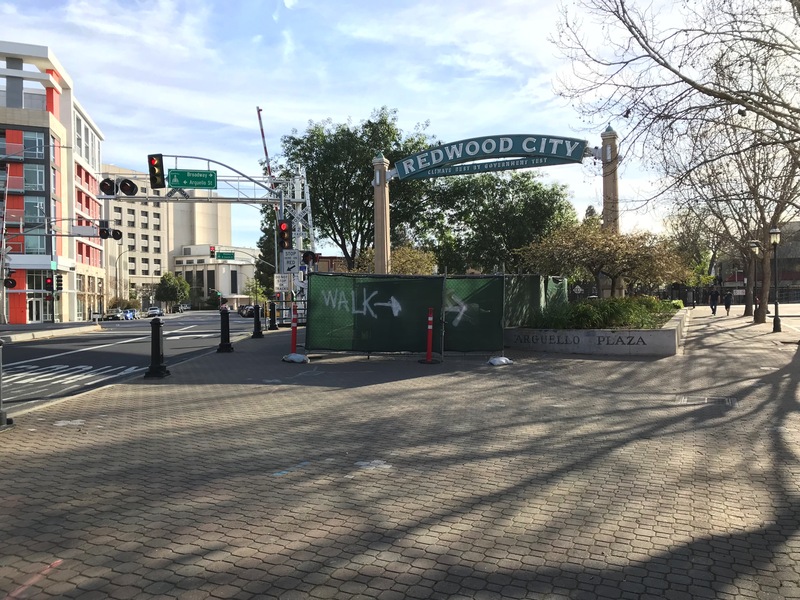 Although these infrastructure projects—along with many others being done by our Public Works Department—may not be as interesting to follow as, say, the construction of the Magical Bridge playground or the Kaiser Medical Office Building, one can argue that infrastructure projects have more impact on the average Redwood City resident. After all, many of us will never play on the Magical Bridge playground or set foot in the Kaiser Medical Office Building. But all of us spend time on the city’s streets and sidewalks, and thus benefit from any improvements that make them more efficient and accessible. Whether we live or work in the city, we depend upon its water and power systems and need them to continue functioning smoothly. 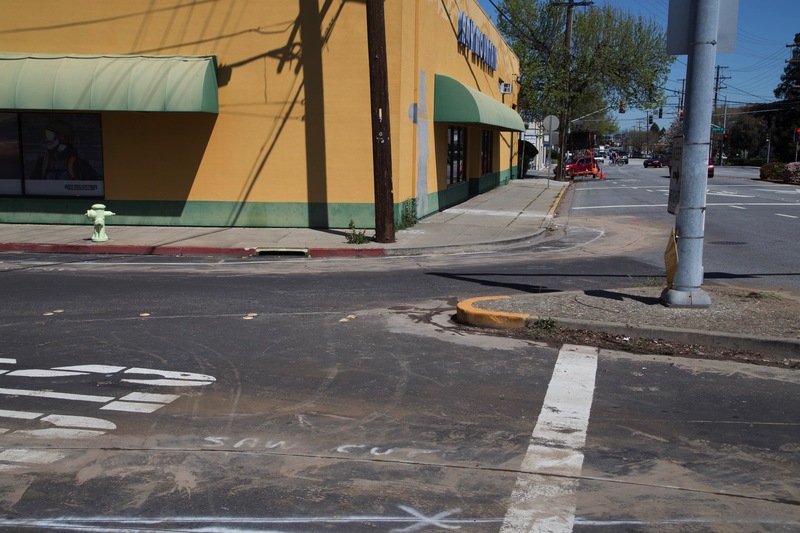 It may be Infrastructure Week here at Walking Redwood City, but hey: I’m willing to champion infrastructure improvements all year round. Speaking of Chestnut St, between Veterans Blvd and Heller St, those raised concrete railroad track barriers are really annoying and unnecessary. I have never seen a train on those tracks. Are they used only during the night, or not at all? Why can’t the barriers be removed, and the tracks filled in and used as a two-way shared middle lane for left turns, for the whole length of the road from Veterans to Heller? Trains still use that track. The barrier is very necessary. Strings of hopper cars carrying aggregates from the Granite Rock AR Wilson quarry near Aromas (https://goo.gl/maps/9sCt98ocGFs) used for concrete-making are plainly visible on this satellite view of the Granite Rock facility off Blomquist St.
Those are interesting. I never thought to search the web for video of those trains! It’s amazing what you can find–and it’s amazing what people are fascinated by and thus will post to the web. I’ve certainly seen hopper cars sitting on the Granite Rock property as I’ve walked by; I knew that the rail line was still in active use. I just had never actually witnessed the train moving. Thanks for the links! Thank you Frank, Donna, Greg, and Adrian for all this information on the Chestnut tracks. The trains run slow enough that crossing arms are not need at the intersections. I wonder what ambulances and fire trucks do when the intersection they need to cross is blocked by the slow moving train, especially at Veterans Blvd going to the Kaiser hospital? Where would GraniteRock move to if the proposal to redevelop that area into an office park moves forward? @Samuel, the Harbor View office building proposal is on the Hwy 101 side of Blomquist, on land across from Granite Rock, and so shouldn’t force a move. Just like at all RR Xings all over the US and world, emergency vehicles must either wait at or detour around crossings blocked by trains. Thanks for the infra-structure report, Greg. This week I was driving down Chestnut, toward Veterans, and once again was impressed by the awkwardness of the Chestnut/Broadway intersection, from the East bound Chestnut side. Because the street is also an active rail line, the stoplight-turn signal can’t be extended properly over the turn lane. This means that about 30% of the time some newbie or confused driver a) waits too long in the straight ahead lane because they are waiting to turn left, or b) does a two-laner turn cutting off a driver from the actual turn lane. It makes life more exciting, but it is not a reassuring sort of intersection. I think that they could improve this greatly with painted bold arrows in the lanes. Do you ever hear of that kind of infrastructure work? I haven’t heard of anything specific about this intersection, but of course the city does periodically do “that kind” of infrastructure work. Chestnut is a problem at multiple points; I agree that this particular intersection is bad (I’ve used it a lot in the past, less so now that the Broadway Plaza center is mostly empty) but so are the intersections of Chestnut from Main to El Camino. And, for that matter, Chestnut and Middlefield… Having an active rail line run right down the middle of the street is problematic on many fronts, but is unlikely to change, unfortunately. One thing I would recommend: when you see issues at this (or any other) intersection, report it to the city using the MyRWC app (or the website: http://www.redwoodcity.org/departments/police-department/report-crime-online/myrwc-report-problem-request-service); perhaps if the city gets enough complaints, they’ll take a hard look at the intersection and consider alternatives.